Ah, 2018. The year has only begun and it's already going to the dogs! Perhaps it’s appropriate that the year begins with a couple barks. 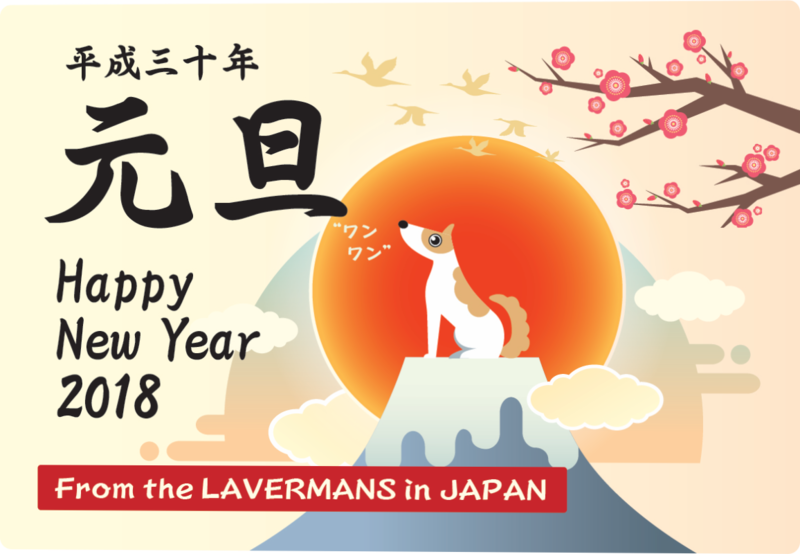 After all, 2018 is the Year of the Dog in the Chinese (& Japanese) zodiac. Japan knows how to market this idea. Dog-themed ads, products, foods, stamps and greeting cards are everywhere. And our local pet shop has a great discount on Shih Tzus (while supplies last) this first week of the year. But wait! Is it really THE YEAR OF THE DOG? Jesus, quoting from Isaiah 61, pointed to the fulfillment of the prophecy in himself. Because of Christmas. Because he came. This would now be a favorable year! Jesus was not referring to a calendar year of 365 days, but an era of time during which man can be redeemed by His work at Calvary’s cross. This year, 2018, and every year until the rapture of the church, is an era and year of God’s favor! It is a year of possible forgiveness in Christ, and hope for this life and eternal life to come! 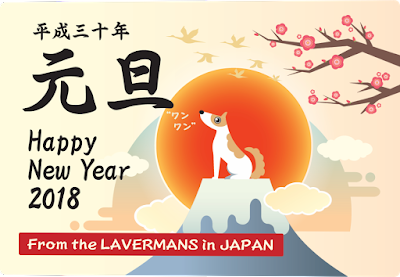 But how many Japanese will know that 2018 is anything but the year of the dog? Frankly, very few. In fact, 99.5% percent have no idea. We have to tell them the year can very different! While it is still the year of the Lord’s favor, and before this era of time comes to an end, we are all entrusted with good news to share with our world. 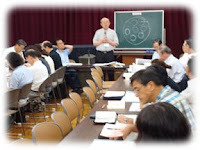 Kaori and I believe God would have us to preach this good news and “proclaim the year of God’s favor” in Japan. It is this conviction that moves us forward here in the year ahead of challenges and blessings. So, thank you for sending and supporting us in this work! 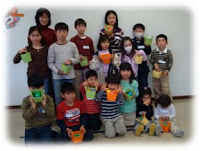 Your confidence in God to work through us in Japan is encouraging and humbling! If you would like to become a support partner with us in 2018, it’s really easy to do, and it’s a really critical time for us in our start of Vision 2020. In 2018, we’d like to be fully supported again for this work. We’re making progress, but still need monthly commitments. Click here to begin, or here for more details. Pass this along. God bless you in 2018, this year of His favor for the world. Happy New Year! On February 14, ladies get the murky duty of judging where they stand in their relationships, and giving accordingly. 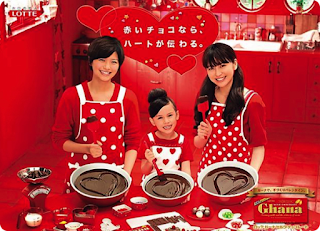 First, there's the "giri choco" or "obligation chocolate." This is an inexpensive bag of sweets that you give to the guys around because you must. It's expected. It's a way of "greasing the skids" of the relationships in life. All of them. Well, mostly. Just don't get caught not giving to someone! Then there's "honmei choco" or "favorite chocolate." These you only give to guys you want to show your affection toward. These sweets tend to be rather expensive, and probably even homemade. Oh, yes! There's the "tomo choco" or "just friends chocolate" as well. That's a whole other category of relationship to figure out. With all this chocolate swirling about, you'd think the guys would be thrilled. Not really. Getting chocolates comes with a whole set of obligations. Men must reciprocate on "White Day," a month later on March 14. Each and every chocolate needs to be responded to, often with one worth three times as much as received. Talk about putting on the pressure! No doubt about it. In spite of all the heartshaped boxes, Valentine's Day in Japan is less about love, and more about duty and obligation. 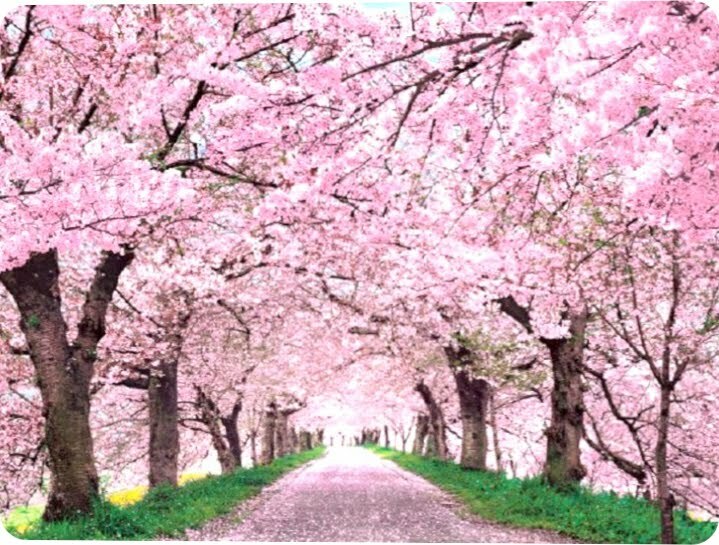 Japan, if all this makes you yearn for a true unfettered expression of love, forget about the chocolate thing. Look to the cross of Christ instead. Here is a love given out generously to all − without levels, obligations, or payments still owed. John 4:10 says "This is love: not that we loved God, but that he loved us and sent his Son as an atoning sacrifice for our sins." Now that's a sweet deal! Obligation chocolate? Nah! I'll take unmerited love. The pair of Japanese hostages are forever linked in our minds. We saw them in orange jumpsuits kneeling together in the Syrian desert sand. Behind them loomed a masked militant demanding a ransom in exchange for their lives. Tense days followed. Desperate negotiations and pleas for mercy. And then came the dreaded news of their horrific murders at the hands of their captors. Japan and the world were shocked and outraged. But you might have missed the rest of their linked story. 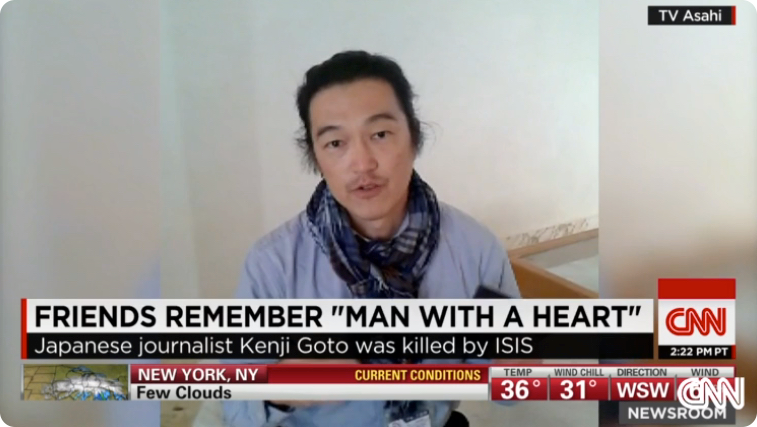 Kenji Goto and Haruna Yukawa were bound together far before their joint captivity. Yet the paths that led them to each other could not have been more different. One made a life in the midst of trouble. The other had a troubled life. In Kenji, we see a glimpse of Christ’s love. Kenji was a Christian. (This in itself is remarkable considering the small number of Japanese believers.) As a journalist, he traveled to war-torn places to highlight the plight of persecuted groups and displaced refugees. He championed the cause of the weak and helpless, people in crisis and conflict who needed rescue from their circumstances. Kenji’s pastor stated that his Christian convictions influenced this selfless work. Haruna was a very different man. If Kenji was a picture of Christ, Haruna was an apt picture of the world, mankind deformed by sin. Haruna was wounded deeply by life in ways that twisted his personality. A string of setbacks, including bankruptcy and the death of his wife, had damaged his psyche. He supposed himself to be a reincarnated Manchu princess. He became obsessed with right-wing nationalism and weaponry. His unstable behaviors ranged from suicide attempts to high-adrenalin risks. He had entered Syria for the self-motivated purpose of using the instability of the region to sell security services. Haruna clearly needed a rescue from himself. 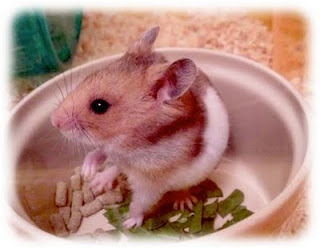 Haruna’s rescue began when he met Kenji. In Kenji, Haruna found a friend who overlooked his faults and peculiarities, and cared for him even to the point of jeopardizing his own life. When Haruna was first captured by the Free Syrian Army in March of 2014, Kenji was called by his contacts to help question this Japanese prisoner. Instead, Kenji was able to negotiate his release. The two returned to Japan together. In October 2014, Haruna returned to Syria and stumbled into trouble again. This time he was nabbed by ISIS. Kenji went after his hapless friend in a quest that resulted in his own capture. The rest of their fateful story together played out in media reports worldwide. If Kenji is a picture of Christ, and Haruna a picture of the world, it’s not hard to see the gospel parallels in this story. Kenji determined to bring his wayward friend home. Christ came to seek and save his wayward people, and bring them safely home. Kenji looked past his twisted friend’s oddities. Christ’s divine love looked past the marred image of God to see the intrinsic worth of the soul. Kenji set aside his personal interests and risked his life to free his friend held hostage by militants. Christ set aside his deity and paid the ultimate price at Calvary to redeem mankind held hostage by Satan and sin. If Haruna’s life had been spared by the sacrifice of Kenji, the redemptive illustration might have been complete. We wanted a different outcome for both of them. But what transpired in their final days of captivity together we may never know. Perhaps Kenji’s tender faith softened his heartless captors to consider the ways of Christ. Perhaps Kenji’s selfless testimony humbled Haruna to spiritual conviction. Perhaps the two safely returned to their true homeland of eternity in heaven together after all. Heaven will tell their full story. This side of heaven, we can let their story inspire our own. We can drink in deeply that selfless, pursuing divine love that gives itself for selfish, wayward man. The cross shouts to us that we are loved more than we can know or understand. We can let that love motivate us into selfless ambition for our fellow man. Our own divine rescue of love constrains us. The Blue Light has Come? 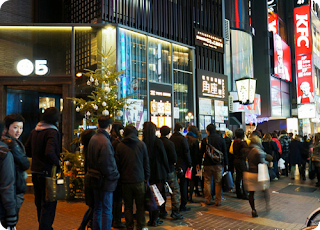 This Christmas, Japan is aglow with big news. Big BLUE news. Three brilliant Japanese physicists, Hiroshi Amano, Isamu Akasaki and Shuji Nakamura, have been awarded a Nobel prize for their creation of the blue light-emitting diode (LED), a key to energy-efficient white light. 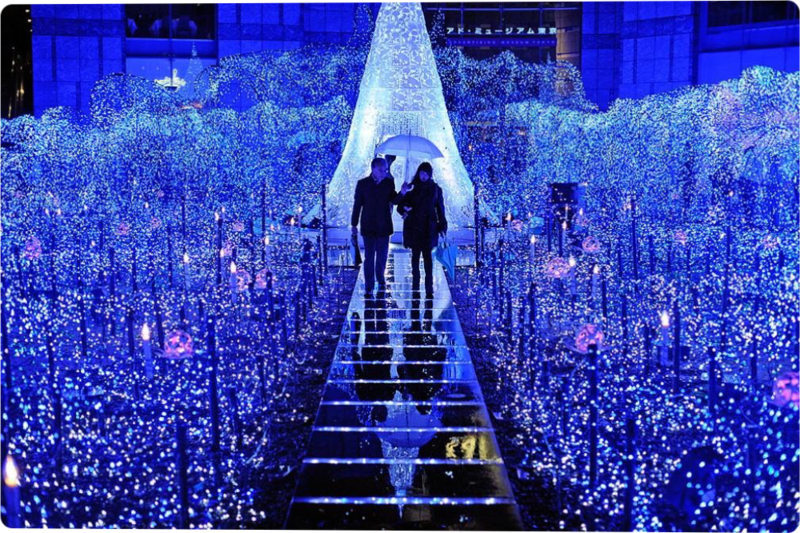 Twinkling blue light displays throughout Tokyo commemorate the occasion. The faces of the three are splashed across media outlets. Interviews and guest appearances abound. The emperor confers a national award in a special ceremony at the Imperial Palace. Everyone who is anyone attends the galas. The people of Japan are celebrating the gift of light! The Nobel Prize committee declared, "This LED holds great promise...to increase the quality of life for billions of people." The blue light has come? Big deal. The TRUE LIGHT has already come! It's Christ that truly "holds great promise to increase the quality of life for billions of people." Yet the arrival of our Savior was met with so little fanfare. No national awards. No invitation to the palace. No photo opps. No fan letters. No glitzy festivities. The only special invited guests were a stable of animals and some outcast shepherds. And so it is up to us today, the people of the cross, to CELEBRATE the gift of Light. Just think! The Light of the World has dawned...for you! The illumining work of his Spirit flooded your darkened mind. God rescued you from the kingdom of darkness and made you a citizen of the kingdom of light. Your gloomy tomorrows were swept away by brilliant hope. There's no more need for groping along the dark alleys of life; now divine guidance lights your way. And the ominous shadow of death has been driven off by glorious resurrection hope. The dawn of TRUE LIGHT in our world and your life is cause for great celebration. So enjoy your Christmas! And while celebrating, remember it's also up to us to SHARE this gift of Light. Nations and peoples are still "walking in darkness" (Isa 9:2). In Japan it adds up to more than 99% of the population. 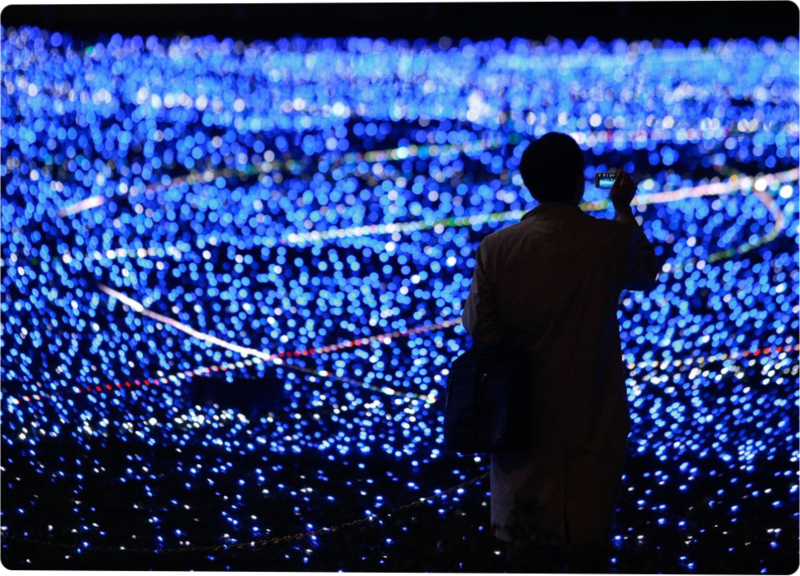 There's a tinge of irony in Japan becoming a Nobel laureate for illumination. One also wonders why, in this spiritually dark country, the people are increasingly enraptured by massive seasonal light displays. Can it be that the Japanese are searching and fumbling through the darkness for a TRUE LIGHT that the Spirit whispers to them about? Already in the dark corners of Kawasaki, Japan, that True Light has dawned. In 2014, darkness fell just a little bit more in our corner of the world as people responded by faith in Christ to God's call on their heart. Together with you, we push back the darkness inch by inch. We proclaim the "Light of the World" with all the strength and capacity God gives. We claim the promise of Isaiah 51:4 that "nations will come to your light, and kings to the brightness of your dawn." Blue LEDs? They might change something somewhere perhaps. But the TRUE LIGHT of the world? He'll change everything for sure! Let's celebrate Him. Let's share him. Merry Christmas! Japan spells Christmas with three "finger-lickin' good" letters: K-F-C. Move over sushi and wasabi, fried chicken is the main course on Tokyo tables at Christmastime. The roots of this craze go back four decades. On a Christmas day in the early 1970's, foreigners in Japan flooded the newly-opened KFCs, gobbling up the colonel's best recipe. It was a poor substitute for the visions of golden-brown turkeys that danced in their heads, but it was the only crispy bird to be had around. A shrewd KFC manager watching the foreigner stampede saw yen signs. In 1974, the company presented its first Christmas meal: chicken and wine for $10. It sold well in spite of being costly for its time. Today, a family bucket will set you back $40. Still, the Christmas fried chicken fad has taken root in a big way in Japan. A quarter million buckets (or boxes) of chicken will be sold on Christmas day alone. A savvy marketing blitz helps. Weeks ahead of time, a flurry of coupons fill mailboxes of urban homes. TV ads feature Japanese children in Santa hats (and with KFC barrels in hand) dancing about to catchy jingles. Even the revered statue of the colonel in front of KFC stores gets dressed up in a Santa suit (somehow it fits his mystique). Stores take orders four weeks in advance. Long lines form early on Christmas eve to pick up the crispy parcels. KFC has become the go-to meal at Christmastime. Colonel Sanders would roll over in his grave if he knew that KFC has become the focus of Christmas in Japan. You see, he became a born-again Christian late in life. He knew the focus of the celebration was Christ. We do, too. Right? I've missed a few Christmases in America. Christmas 2013 is our first in 10 years. And I've come to a conclusion after spending Christmas in Japan for awhile and now being home on furlough. I don't know whether it's really true that "Nobody does chicken like KFC." But it's definitely true that "Nobody does Christmas like America." The music and concerts, the lights and decorations, the get-togethers and endless food, the TV specials and store sales...the celebration runs the gamut from dreamy and reflective, to bustling and hectic, to grand and breathtaking. We know how to do Christmas! But we also know how to lose our focus in the whole celebration. It turns out that Christmas really is all about KFC. That is, Keeping the Focus on Christ. Time with family and friends, twinkling decorations, tasty food, thoughtful gifts are all wonderful trimmings. But we lose out on the main course if we miss worshipping the One whose birthday celebration it really is. When it comes to Christmas, it might be too much to ask that America would simply scale it back, tone it down, or turn some of it off. Simpler celebration doesn't seem to fit our bigger and better sensibilities. But at the very least we can individually take time to simply worship him. 1 Peter 3:15 says, "But in your hearts sanctify him as Lord." In the middle of it all, choose things that will draw you into worship of Him. And choose to see the rest in a new worshipful way. Choose to let the light displays remind you of the Light of the World who came and "gives light to every man" (Jn 1:9). Choose to let the table spread with food remind you of the Bread of Life who came and "gives life to the world" (Jn 6:33). And, of course, choose to let the presents (however quirky they may be) remind you of the "indescribable gift" (2 Co 9:15) who came to give forgiveness and cleansing, adoption into God's family, a place in eternity, and he himself to us. P.S. — Anyone want some Japanese KFC coupons? 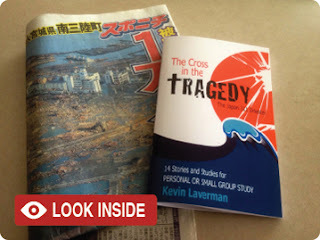 I've finished collating a 64-page book of 14 chapters themed around Japan's March 11, 2011 triple tragedy. The book has stories, small group study discussion questions, culture notes and more. You can see the details on our website page here. You may find it useful for personal study and devotions, small group Bible study, or missions education. A leader's guide PDF is also available for small groups here. Take two weeks for Japan, spending just 10 minutes a day to read each chapter and pray! 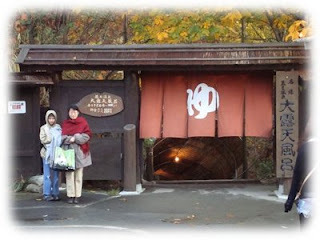 This is my best effort to share with you our experiences from the March 11, 2011 triple tragedy in Japan, and to look at them through a spiritual lens to see what God what want us to know. We ask for a donation of $5 to cover printing and mailing costs. You can use the order page here on our website to pay, or make arrangements with us personally. Put a broiled fishhead in your entryway. Pile salt just outside your front door. Avoid cutting your fingernails after dark. Paint your house neon yellow. Do not whistle at night. What do all these odd actions/non-actions have in common? They are ways to ward off bad luck in Japan. Japan is filled with such superstitions. While some are modern urban legends, many come from the animistic roots of Japan's religious beliefs. The many (millions of) gods and evil spirits in nature are capricious and mischievous. They must be appeased or driven away lest they bring death or misfortune to oneself. Many superstitions surround the fear of death and suffering. The numbers four and nine are unlucky because they are pronounced in the same way as death (shi) and suffering (ku). Hospitals avoid the use of these numbers for rooms and floors. You'll also never find a set of four dishes in Japan. Plateware comes in sets of three or five. 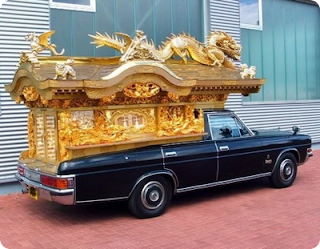 Japanese are careful to hide their thumbs when they see a funeral hearse. Not doing so will mean an early death for your parents. In Japanese, a thumb is called your parent finger (oyayubi). Protect your parents by protecting your parent finger. Other actions that invite death include bringing potted flowers on a hospital visit (a play on the word for "root" in Japanese suggests the patient may not recover). Sticking chopsticks in your rice (this is only for funerals). Using a single chopstick in both hands (only done to pick up bones after cremation). Sleeping with your head toward the north (dead bodies are laid out in this direction). Being in the middle of a group of three when your picture is taken (you are in the best focus and the pull of the camera upon your spirit is the strongest). I know you're asking by this point, "Do Japanese REALLY believe that?" Unfortunately the answer is yes. The culture is saturated with it. 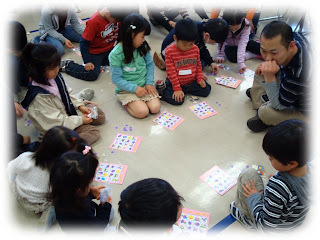 The selling of fortunes (uranai) in Japan is a major business. 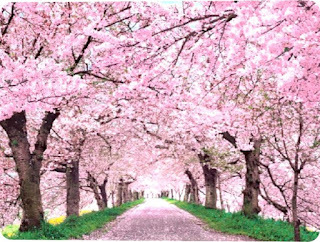 Horoscopes and numerology play a big part in the psyche of the Japanese people. The availability of such with the explosion of smart phones has greatly exacerbated the problem. And so one of the challenges in our mission work in Japan is speaking to a culture that is filled with superstitious beliefs. How do we respond from the Bible? 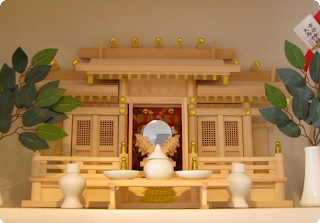 The spiritual scene in Japan is not unlike the superstitious city of Ephesus. The people of Ephesus lived in the shadow of the great temple of Artemis (Diana). Priests and "miracle workers" abounded. Occult worship was everywhere. The city was preoccupied with the black arts. The worship of Artemis included prostitution and mutilation rituals. Into this city of magic and witchcraft comes Paul with a message of the true and living God. It is helpful to read the way that Paul speaks to the Ephesian church in this culture of superstition in his letter to them. Recently I read Ephesians afresh with this "addressing-a-culture-of-superstition" lens. Stop and take a few minutes to do the same. I'll share a few insights in a future post. God sacrificing his own to save many. The story has a familiar gospel ring to it. Hasn’t God done the same for us, his children? He’s held back the full punishment headed our way and let it crush down instead upon His beloved Son. That's real salvation! The end? No, God still has good things for the seaside church. The cross was found among wreckage and placed atop a beam (photo above). There it speaks powerfully to the many people that pass by. In the last 8 months the church has seen more visitors coming to pray in that location than in all its years of existence. The church itself, the members, are meeting in a coffee house. The video clip here tells a little about the effective outreach God has given them already. God has his “Easter Sunday” good purposes in every “Good Friday” disaster! His family perished in the water along with hundreds of others. His beloved town was destroyed beyond recognition. His family home and grave markers were washed away. First the earthquake. Then the waves of water that crushed everything in their path. There was little warning of the tragedy that came ashore that day. In the midst of his grief, the man desires that generations to come not endure the pain and sorrow that he is going through. They must be warned of the danger of tsunamis! They must not build homes along the shoreline! The man devises a warning system: a marker stone. The year is 1896. The Meiji-Sanriku tsunami has just killed 22,066 Japanese. Hundreds of these stones are found along the coastline of Japan. Some are more than 600 years old. "High dwellings are the peace and harmony of our descendants,” one reads. "Remember the calamity of the great tsunamis," another stone warns. "Do not build any homes below this point,” an inscription on another stone advises. In the bustle of modern Japan, many disregarded such good advice, building communities right along water's edge. Perhaps they took comfort in the sea walls built in the 1960's after a smaller tsunami. 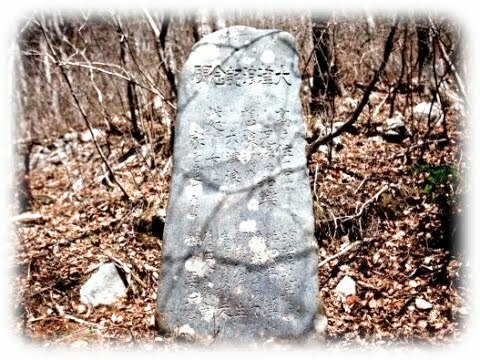 But in the town of Aneyoshi, a centuries-old stone saved the day. 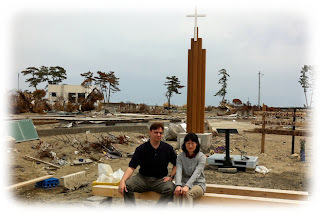 It was advice that a dozen or so households of Aneyoshi listened to carefully, and on March 11, 2011 their homes and lives were spared from a disaster that flattened low-lying towns all around. A God that loves us infinitely and knows us completely desires that we be spared from personal disaster in this life. He desires that we be spared not from physical death, but from spiritual, emotional and relational death that poor choices and rejection of His ways can bring. His warnings are left for all generations to know and heed. The warnings in His Word are not raging outbursts from an angry God. His warnings are gracious love calls that say, "I am for you. I want you to enjoy everything I have to give you. Listen to my wisdom for your life." As small aftershocks keep coming two and a half months after the major 3/11 quake, Japan's hi-tech Earthquake Early Warning System is getting increasing scrutiny. The hi-tech system was rolled out to much fanfare just a few years back. 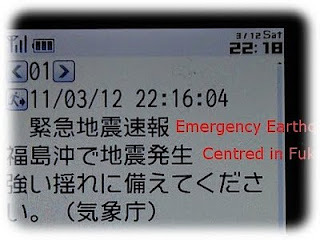 It's set up to ring, vibrate and flash the 125 million plus cell phones throughout Japan when an earthquake is imminent. Sounds great. Makes me feel more secure. Technology is infallible, right? The problem is that technology, and this system, still depends on a fallible human link. 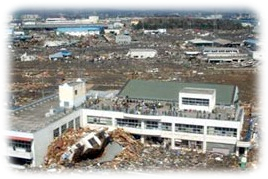 The biggest failing of the system was with the 3/11 quake. No early warning from cell phones. Several hours later, long after the tsunami had done its worst, the cell phones spewed out their first warning of the day. No doubt the person asleep at the switch with this one paid for the mistake with his job. Since then the person in charge of pushing the button to alert all cell phones seems to be overcompensating for the 3/11 early warning boondoggle. The alert sounds. The cell phone vibrates off the table, lights flashing. We scatter away from windows. We open doors that might get jammed. We grab something solid and wait. And then...and then...nothing. It's not that we're disappointed there wasn't another aftershock, it's just that these "cry wolf" false warnings that rattle us out of bed and our days activities are making it harding to trust the early warning technology at all. 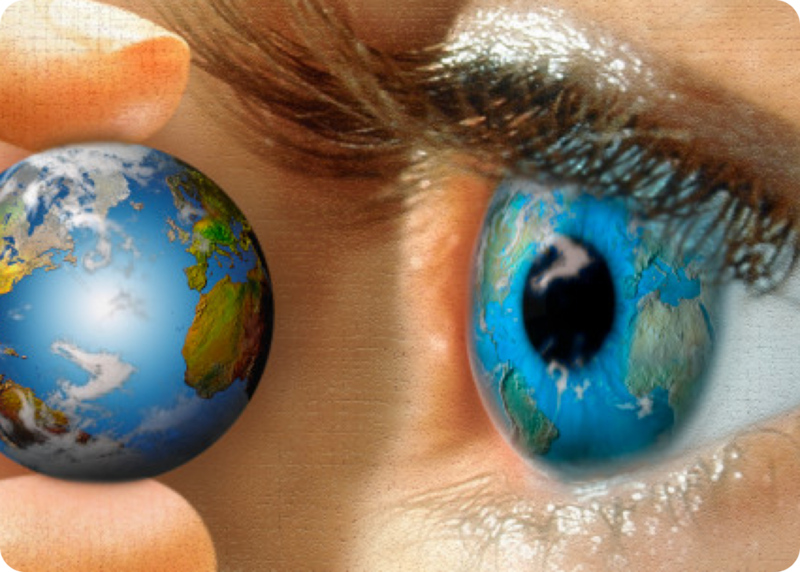 Create technology so we needn't depend on God. Find comfort and security in buttons and gizmos and transistors. This is the natural direction of man, full of himself and his desire to master and rule his world. There's nothing wrong with using God-given wisdom to create technology to better our lives. But when dependence on technology moves us away from dependence on God, a problem emerges in our heart. Japan has long had this unhealthy dependence on technology to the exclusion of God. Its spiritual awakening starts with realizing the limits of man's wisdom and abilities. Pray that this disaster will open Japan's eyes to the need for a dependable source of security, the unshakeable ROCK, our God. There's a good reason that Jesus chose "birds of the air" over "hamsters" when illustrating quiet dependence in his Sermon on the Mount. Hamsters don't fit the ideal. Our new pet, our "Christmas ham" is a fun addition to the family. 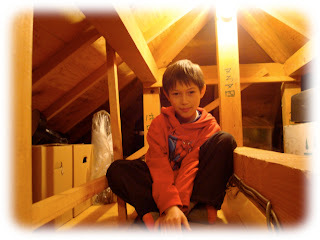 Kaori said, "I need something fuzzy around this house (besides your unshaven face)." Justen said, "I think I need a pet." So, we needed to make this addition to our family. "Chocolat" is fuzzy. 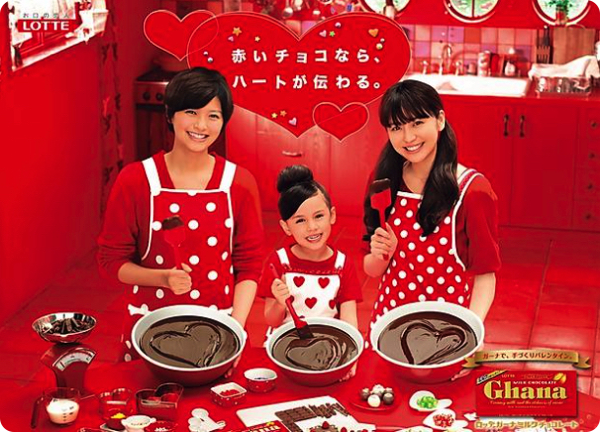 Chocolat is cute. But Chocolat is hardly a picture of tranquility. Chocolat stuffs every possible item in her food bowl into her cheek pouches (until her face is ridiculously huge), then hoards them in her hamster bed. Chocolat squirms and squeezes through any attempt to gently hold her in the palm of your hand. The safety and comfort of a warm hand is no match for what adventure might be out there. Chocolat reminds me of myself a bit. Safe in my Lord's hand, yet unable to rest. Foraging instead of trusting. "Chocolat, stop moving about so much. I'll take care of you. Do you think I can't or won't care for your little needs?" Gulp. I hear the whisper of my Father God to me behind my words to my hamster. Kevin: "Kaori, look at this great labelmaker I picked up for free." Kaori: "Where'd you get it?" Kevin: "It was just laying out on the garbage pile." Kevin: "Someone just threw it away. 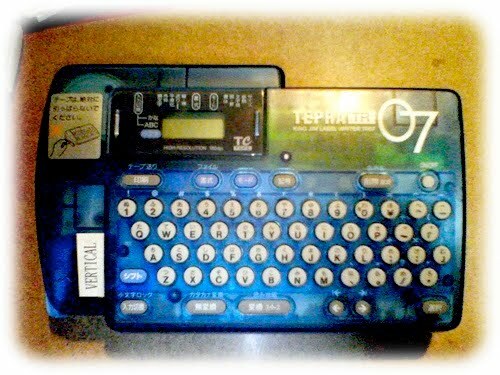 I cleaned it up, put in fresh batteries, and it works fine! It even has a label cartridge in it. I wanted one like this." Kaori: "You picked it up? In Japan, that's called STEALING." Kevin: "From the garbage pile? To me that's called RESCUING!" It's amazing the things that one finds disposed of in Japan. Japan's ultra-consumerism generates a lot of recyclable "garbage." Is something a little dirty, a little broken? Out to the garbage it goes! Japanese by in large don't have a repair-and-reuse mentality. A little cleaning, a little fix here or there, and a lot of money can be saved by the handy finder (it turns out I may have been "stealing"). I was broken and dirtied by sin. God had every right to throw me out onto the garbage pile. I am so glad that He chose to send his Son into this world to search, find, cleanup and re-use me. That was the ultimate RESCUE! (And I suppose in a way it was stealing...from Satan). At Christmastime, thank you, Lord Jesus, for coming down into the garbage pile of this world to reclaim me for your own! I'd been putting it off. Although I knew it was important, taking inventory of our earthquake and disaster gear just wasn't getting done. Japan rests along the "ring of fire" in the Pacific ocean, a stretch of area that is particularly vulnerable to earthquake activity. And so having a backpack of essentials by your door to grab on the way out is, well, essential. 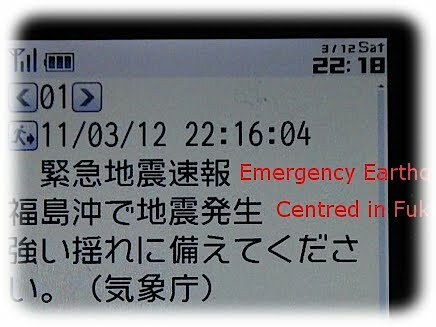 But mild earthquakes in Tokyo have become such a rather regular part of our lives that we've let our guard down a bit. We weren't ready for an earthquake to come. When I finally got around to assessing our earthquake readiness, I realized how unready we were. Wiping the dust off the backpack in the carport, I unzipped it to find a horror story inside. The batteries had attempted an escape, leaking acid all over the contents of the bag. To make matters worse, the acid had actually bored a hole through one of the canned items, which oozed its contents out and into the bag as well. It was not pretty (and now I know why all those stray cats were hanging around outside for awhile). The remainder of the canned food seemed intact, but the expiration date was 5 years ago. The bottled water also looked a bit suspicious. The short of it is: we weren't ready for an earthquake to come. 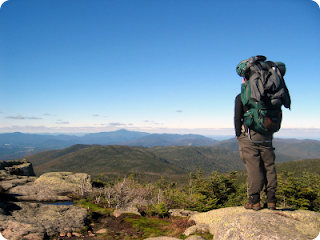 As I replaced and organized new gear for us, my thoughts turned toward the "parables of readiness" in Matthew 25. Five bridesmaids wisely carried extra oil. Two servants carefully used their entrusted resources. A wise and faithful servant works to the best of his or her ability to use what he has been given, and prepares himself for the Master's return and inspection. With God's help, I want to be ready in my life and work for my Master to come. How ready are you? Most days I feel a bit like that helpless child fisherman from a few weeks back. A few weeks back at our Kids English outreach in August each kid was handed a pole with a string attached. A magnet hung from the end of the string. 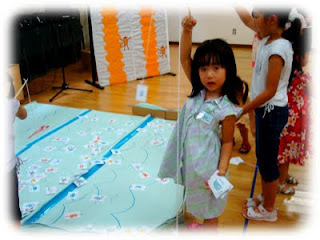 Letter and object cards scattered about in a "pond" had to be snagged by their attached paperclips, then hauled in, brought and repeated to the teacher. One small girl was clearly trying her best, but the string and magnet simply would not cooperate, twirling about aimlessly. She needed help. Placing my hand over hers I steadied the rod and we cast for fish together. What a haul our teamwork resulted in! Most days I feel like that child. Small. Aimlessly casting about. Overwhelmed. And just a bit discouraged. The "fish" in Japan simply aren't biting the Gospel message. But have I forgotten that the Master's hand is on the rod with mine? He's steadying, guiding, and supporting each cast. He's smiles down as we work together. Why had I gone about solo fishing in frustration? Instead I surrender to the Master's guidance, instruction and care, and we haul in the catch He had in mind. 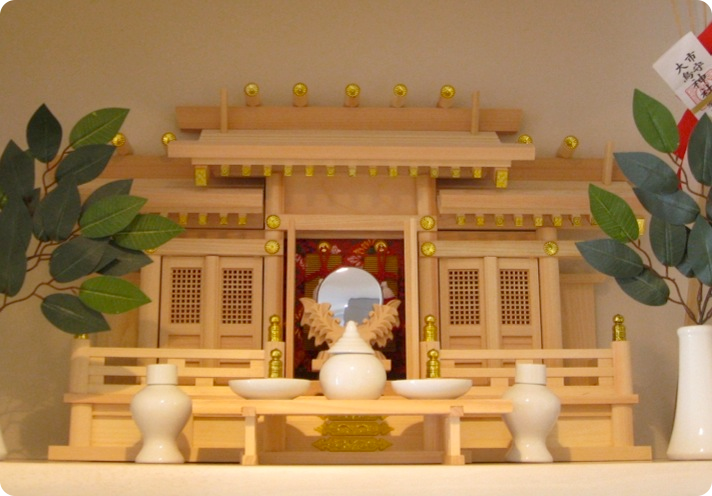 As the year draws to a close, Japanese people are preparing for the year’s most important holiday by cleaning their houses and decorating their front portals with pine and bamboo. On New Year’s eve, millions will prepare buckwheat noodles, signifying longevity and prosperity, and millions more will visit their local shrine or temple. In another time-honored tradition, a minority will celebrate the year’s end in quite a different fashion; they will vanish into thin air. New Year’s eve, when people generally clear their debts, has become the most popular night for yonige, (the midnight flight). People who have fallen into debt, simply disappear in the night to start a fresh life in an anonymous city or country. So common is the practice that it has spurned an industry of removal companies specializing in midnight dashes, even avoiding burly men with baseball bats, called variously benriyasan, (‘Mr. Convenient for Anything’) or yonigeya (‘Midnight Flight Shop’). These companies are good at disappearing acts. Once a family has dashed, the yonigeya will clear out the contents of the house in 15-30 minutes, storing them in a secret warehouse until they can be reunited with their fleeing clients. Full-service companies offer leased property and untraceable phone lines in a new city and can, for a hefty fee, provide a new identity, which is no mean feat in tightly documented Japan. For believers we usually advise, not to flee but to face the music. Jesus says to us, "Come to Me, all you who labor and are heavy laden, and I will give you rest." (Matthew 11:28) Don't run away from Jesus, run to Him! He will shoulder your burdens and give you rest! Could Bach bring Revival to Japan? 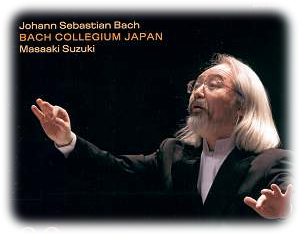 Christian History & Biography reports that tens of thousands of Japanese are coming to Christ through the music of Johann Sebastian Bach. This is primarily thanks to organist and conductor Masaaki Suzuki. When he performs the St. Matthew Passion during Holy Week, the concerts are sold out, and afterwards the stage is crowded with people asking about the messages in Bach’s music. The messages are thoroughly biblical, so much so that Bach’s work was once called “the fifth Gospel.” In the words of one Japanese musician who converted to Christianity: “When I play a fugue, I can feel Bach talking to God.” Bach, a devout believer, would no doubt rejoice to know that centuries later his music is still spreading the good news of the gospel. 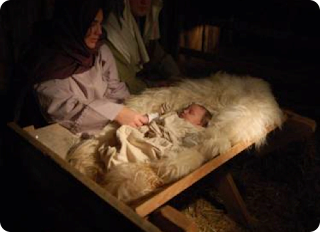 On the night of Jesus’ birth, an angel appeared to shepherds. Why shepherds? Perhaps they fit with the humble circumstances of His birth; perhaps God wanted to point back to King David, who began as a shepherd; or perhaps He wanted to point forward, to the arrival of the Good Shepherd and the Lamb of God. In any case, the shepherds responded to the angel as others had, with both awe and terror. “Do not be afraid,” the angel told them, then he proclaimed “good news of great joy”—the gospel—“that will be for all the people”—universal in scope. “Today in the town of David”—prophecy fulfillment alert!— “a Savior has been born to you; he is Christ the Lord”—the Messiah, the Anointed One (vv. 10—12). When Yosuke, a parrot, flew out of his cage and got lost, the little guy did exactly what he had been taught -- recites his name and address to a stranger willing to help. Police rescued the African Gray parrot from a neighbor's roof in the city of Nagareyama, near Tokyo. After spending a night at the station, he was transferred to a nearby veterinary clinic, while police searched for clues. “I tried to be friendly and talked to him, but he completely ignored me,” policeman Mr. Uemura said. The parrot kept mum with the cops, but began chatting with the veterinarian. “I'm Mr. Yosuke Nakamura,” the bird told the vet. He also provided his full home address, down to the street number, and even entertained the clinic staff by singing songs. “We checked the address, and what do you know, the Nakamura family really lived there. When we told them we had found Yosuke, they were elated,” Mr. Uemura said. The Nakamura family had been teaching the bird its name and address for about two years, and they were very happy that it finally paid off! Just like that parrot, and just like sheep we have all gone our own way and completely went off course! All we like sheep have gone astray; We have turned, every one, to his own way. (Isaiah 53:6). 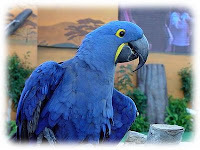 To us who are more intelligent than parrots and sheep, God has explained how we can find our way back to Him! You will find Him if you seek Him with all your heart and with all your soul (Deut. 4:29). Much of the way that Japanese religion merges with everyday life in Japan is in areas of physical cleanliness. The relationship between the gods and man in the Japanese worldview comes down to the matter of personal purity. If one is to be on good terms with the gods, it is believed that one must avoid things which would cause physical pollution. If it occurs by some accidental way, it must be taken away. And one great method for doing so is the most obvious one: a good hot bath. Japan is blessed by many mountains, and consequently many hot springs. One can see here how the Bible speaks to this matter of cleanliness before the God who has made us and loves us. The cleansing God offers has nothing to do with a physical bath. In fact, it is quite useless for a right relationship with our Lord. "Although you wash yourself with soda and use an abundance of soap, the stain of your guilt is still before me" (Jer 2:22). God is into the deep cleansing that man needs, begins at the heart polluted with sin, and uses the agent of the Holy Spirit. "He saved us through the washing of rebirth and renewal by the Holy Spirit." Having said that, our family does enjoy a good hot spring bath from time to time for the simple recreation of it. Here's a photo of us last week going to the famous Mt. Zao hot spring. It's an outdoor sulphur spring that leaves one with an unmistakeable smell. Rather ironic that bathing leaves one smelling. I had heard about these. The famous square melons of Japan. But I laughed off the idea as nothing more than a funny rumor. Until I saw them myself, that is. Yes, Virginia, there is a square melon! And they are very expensive (around $100 each). 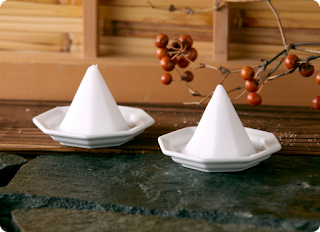 Japanese farmers form these by placing them in glass cases while the melon is still young on the vine. Click the picture for a bigger view. But other than being an interesting piece of cultural trivia, of what practical use is this square melon? As it turns out, it is a perfect solution for the space-conscious urban Japanese. A round melon requires a lot of room in one's refrigerator. But these square melons are grown to the exact size of typical shelving in a Japanese refrigerators. Talk about "cornering" the market! We're reminded in Scripture of something else that grows to the shape of its surroundings unless we're careful: "Do not conform any longer to the pattern of this world, but be transformed by the renewing of your mind." Rom. 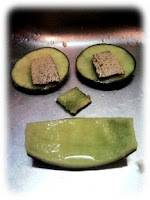 12:2 Our minds, like melons, need to break out of the conforming pattern of this world. How? "Whatever is true, whatever is noble, whatever is right, whatever is pure, whatever is lovely, whatever is admirable--if anything is excellent or praiseworthy--think about such things." Phil 4:8. That's how we grow the way we were designed to be! So how's it growing with you? We went time traveling again last week. The trip to the States from Japan is always a very literal trip back in time. We arrive at our destination in Chicago at an earlier time than we left from Japan. This is possible because we fly east and cross over the international date line. In the case of last week, we left at 6:30pm on a Wednesday and arrived at 4:20pm the same day. Witnessing two sunsets the same day is very odd. It's enough to put one's body into a jetlag tailspin. And it did. And so again this past week we've dealt with the problem of being wide awake by 3am, and ready to crawl into bed by 4pm the same day. Our bodies do not handle time travel very well apparently. Our bodies grumble at the new schedule, the new and sudden change in diet, the new surroundings and climate. 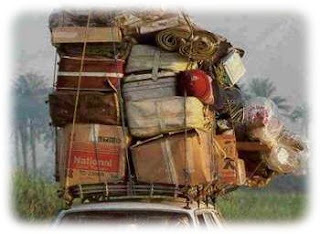 The physical adjustment of coming to the States is one real challenge. Still another challenge to this time travel is the mental adjustment. Big and small changes that have occurred in our culture and lives of people may have been easily absorbed if meted out one by one over time, but when you have been gone for a while and suddenly are met with all these changes at once, your brain begins to hiccup. You feel a bit of the Rip Van Winkle syndrome. You wonder if you really belong in this country. When exactly did people begin doing this (i.e., walking around talking to themselves with things stuck in their ear, self-checking their groceries, etc. etc.)? This neighborhood has changed. That person is no longer alive. Those familiar faces have grown older. 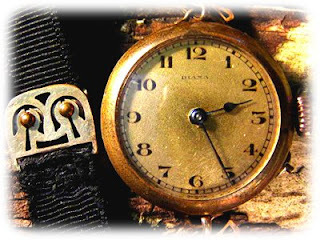 A thousand and one little changes all around make us feel as though we have time traveled into the future. I will always be a traveler in this world as I look forward to the next. This is a good reminder as we begin our home assignment back in to the States. 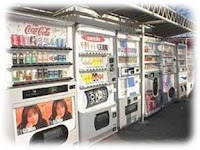 Estimates suggest there are 5.6 million vending machines, which works out to be one for every 20 people in Japan! If you are hungry, for a few coins in a slot, you have a choice of quite a range of hot food like hamburgers, french fries, hot dogs and dumplings. Are you in a rush to get to work or school? How about having some soup from a Cup-a-Noodle machine on the way? In less than three minutes you get piping hot soup. What about a bag of fresh hot popcorn from a machine using a microwave oven to pop the corn in seconds? If you like rice like the Japanese do, you might visit the rice dispensing machines. You can purchase ten kilo bags of rice in eight different varieties! An egg machine features farm fresh eggs. The umbrella vending machines are popular when it rains. We often use automated waitresses in Japan. Just make your meal selection from the machine at the restaurant. Feed your money into the machine then you'll get a ticket which you hand to the cook behind the counter inside. In some places the entire building is a parking machine. Just drive your car into the bay. Each bay rotates through the building to maximize usage of space. Your parking ticket will retrieve your car back to the bottom bay. You back out your car onto the rotating circle. It will also turn your car so you can drive out straight! God is the source of everything we need...and you won't need a coin. Just ask! Go to God for absolutely everything – small or large! We are thankful for the house in Kawasaki our mission has purchased for us to live in. But there is one tiny problem: it's TINY. As with all Japanese urban living, it offers VERY compact living space. Some might say a little too snug for comfort. But as the picture on our wall says, "With love, even the smallest house can become a mansion." No, this is not a new way to press your clothes, it is a daily reality for those who commute into Tokyo from our neighborhood station. 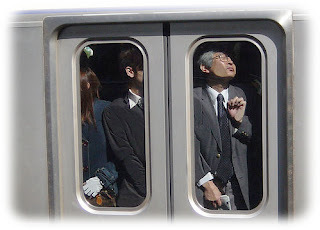 We're sometimes asked by you, "Are the Tokyo trains as bad as we hear?" 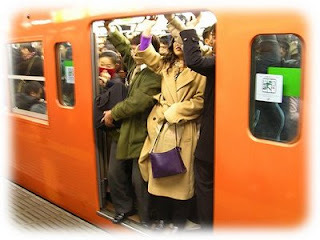 If you have a Japanese definition of personal space, then no they are not so bad. 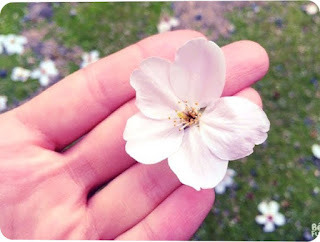 But for most Americans who are used to a wider circle of empty space about them, it is pretty hard to adjust to this part of the Japanese culture. What you do not see in the photo is what no doubt happened about 10 seconds prior to this: the white-gloved station platform attendant literally pushing, squeezing, and otherwise using force to get this man, and others into the train car. Our train line (and neighborhood in general) is changing. They are lying new track to expand the capacity from 2 tracks to 4 tracks. In the process a lot of housing and businesses along the existing line have needed to be demolished. It looks like a war zone in our neighborhood on most days. But when it is finished it is supposed to alleviate some transit capacity problems like this. They promise that trains will only need to be packed to 150% capacity. Yikes! Every once in a while Japanese English goes a little wrong and makes one smile. There are other examples of this on our blog, but one of my personal favorites is this. Kaori would be quick to point out my own bloopers in Japanese have been significantly worse, and no doubt very funny. Yet, Japanese are so polite and courteous as not to laugh. 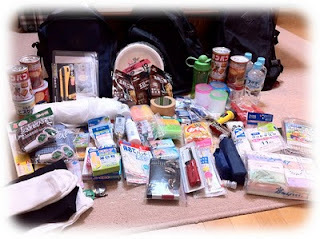 It doesn't take long to accumulate stuff in life, but getting rid of it in Japan is not easy. You can't throw it away without paying extra fees, or breaking it down into its component pieces: plastic, glass, metal, etc. And you can rarely sell it. Having a place to park unwanted stuff would be nice. Wouldn't it be nice to have a place like this to park the stuff of life, the baggage that weighs us down. But wait! That's what Christ came to do! No need to pay extra! "Come to me, all you who are weary and burdened, and I will give you rest." Matthew 11:28. 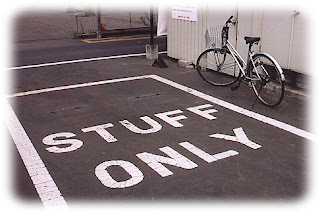 In other words, Jesus says to us, "Park your stuff here! On me! Your hurts and pains and sorrow. I'll take them all without cost. Then give you blessed freedom and peace in their place." Our theme verse for 2007 is Nahum 1:7. "The LORD is good, a refuge in times of trouble. 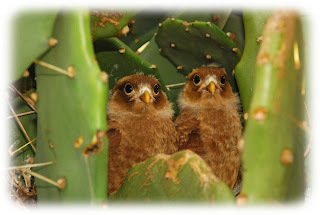 He cares for those who trust in him" This photo of two birdies in a nest in the cactus plant amazes me. What a place to build a nest, mom! Among thorns? How painful! Yet rather than complaining, they simply trust their mother and wait and watch patiently for her return. Yet how often God does the same for us. Though he may not spare us from the pain. He builds a place of safety and refuge in the middle of it all. A place we can find refuge and peace. We trust him. He cares for us. It seems too childish. Too simple. Yet God makes that promise to us through his prophet Nahum. 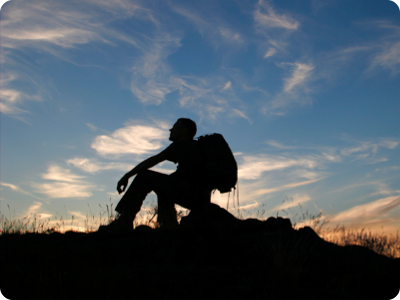 While trusting, we wait and watch for Christ's return. That will be joy!